Buddhism has an almost mystical way about it. Its teachings are ethereal, and its followers exude the idea that Zen-like peace awaits all who embrace the tenets of this enlightenment-seeking religion. Tibetan Buddhism, in particular, is one sect that garners a lot of Western attention. Its symbol of compassion, wisdom, and goodwill—the Dalai Lama—sells out arenas for speaking engagements and encourages his thirteen million Twitter followers with quotes anchored in love, peace, and the common good. However, it can be difficult to get a handle on what Tibetan Buddhists actually believe and how it differs from Buddhism in other nations. Here are five facts about Tibetan Buddhists that can help frame your gospel conversations and prayers for them. One misconception about Tibetan Buddhism is that peace is easily found and kept. However, the search for peace is ongoing and always seems just out of grasp. Tibetan Buddhists are participating in a never-ending cat-and-mouse game to atone for sins so they can live at rest knowing they’ve settled their karmic score. Tibetan lamas (teachers) heavily concentrate on finding this peace while the everyday Tibetan Buddhist focuses on offsetting their bad karma so their next life is a better one. To do this, people recite mantras, meditate, give donations, make pilgrimages, spin prayer wheels, and light incense. The nagging question for Tibetan Buddhists is how to know how many good works are enough to balance out the bad karma they’ve accrued. As Tibetans age, the reality that their life is coming to an end motivates them to get rid of bad karma to improve their standing in their next life. Younger Tibetan Buddhists go to temples to make merit for their next life, but they often lack the urgency of their need to tip the good karma scale. That’s why on any given day, you’ll see elderly men and women walking clockwise around a Tibetan Buddhist temple. Their hands often have sculpted callouses earned from years of rolling mantra prayer beads between their thumbs and index fingers. These callouses are a testament to their devotion to Buddhism. Contrary to popular perception, most Tibetan Buddhists don’t live in a state of peace and enlightenment. Instead, people often fear the spirit world and demons, and they blame everything from illness to bad luck on demonic influence. Demonic entities are depicted in artwork and statues. The famous Wheel of Life image symbolizes the cyclical existence of life, the “three poisons” of ignorance, attachment, and aversion, and the role of karma. It represents the six states of the cycle of life: the realms of gods, demi-gods, humans, animals, hungry ghosts, and hell. 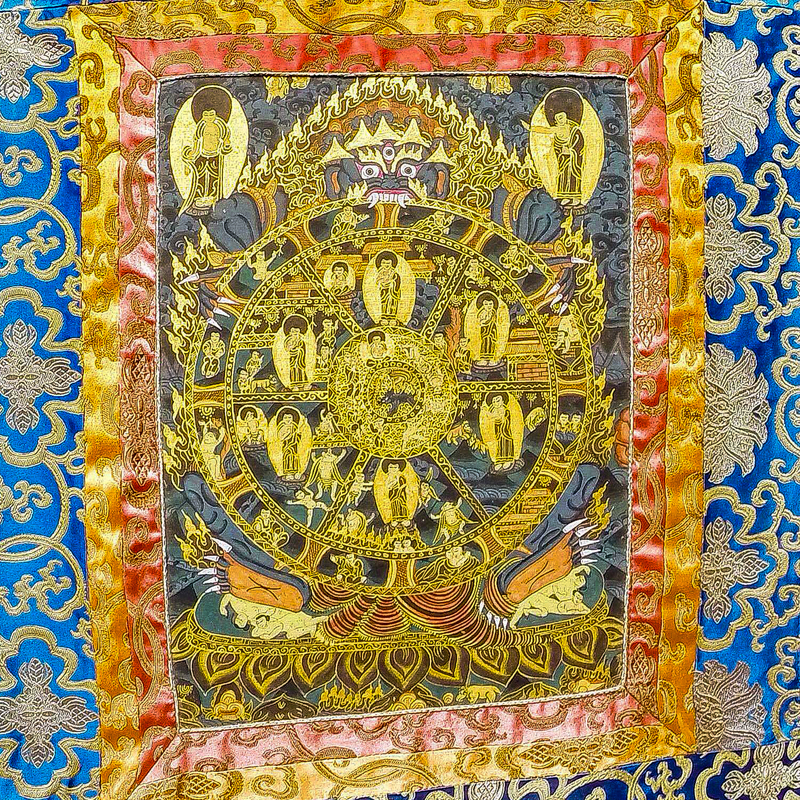 A tapestry depicting The Wheel of Life symbolizes the role of gods and karma in a Buddhist’s journey to nirvana. In the image, Yama, the god of death, personifies impermanence, and he grips the wheel as he bites into it. Yama controls the turning of destinies. Outside of the circle is Buddha and nirvana. Tibetan Buddhists believe getting out of the spinning wheel to nirvana is the goal, and they can achieve this through good works, even if it takes several lifetimes. Failure to atone for bad karma results in a bad next life in the wheel. The two main forms of Buddhism are Theravada and Mahayana, which have different expressions of Buddha’s teachings. Zen Buddhism—a branch of Mahayana Buddhism—emphasizes meditation and is often what Westerners associate with Buddhism. Tibetan Buddhism combines teachings from Tantric, Shamanic and Mahayana Buddhism to form one goal of the soul’s existence: liberation from all worldly vices and hindrances. As the name suggests, Tibetan Buddhism differs from Buddhism in China, Southeast Asia, South Asia, and Japan. The Dalai Lama is specific to Tibetan Buddhism. He is believed to be the incarnation of the bodhisattva of compassion, or, someone who wishes to achieve Buddha status for the benefit of mankind. There have been fourteen Dalai Lamas, dating back to the 1600s, all believed to be reincarnations of past lamas who chose to be reborn for the benefit of mankind instead of moving out of the wheel of life to nirvana. Traditionally, the Dalai Lama is the governing and spiritual leader of Tibet and Tibetan peoples. The current Dalai Lama, according to a Harris Interactive survey, was polled as the most popular world leader in 2013. He serves from exile in India. Tibetans often say, “To be a Tibetan is to be a Tibetan Buddhist.” Buddhist traditions are intertwined in festivals, cultural mores, family life, holidays, births, deaths, and people’s motivations. Becoming a Christian, then, often feels like a divorce from family and culture. Tibetan Christians may struggle with this severance and how they fit into their society. There are an estimated 6.4 million Tibetans who make up ninety-five people groups, many of whom live in China, Nepal, Bhutan, and India. Nearly 97 percent of Tibetans are Buddhist, which means they need someone to bring them the good news of everlasting peace and the message that their sins are forgiven apart from any good works. It’s our hope Tibetans will know that to be Tibetan is to be loved by a forgiving God. Join us in praying for the ninety-five Tibetan people groups. Pray they will know in whom their eternal security is found. Caroline Anderson is a writer for IMB.